Horse Quencher Single Serving Travel Pack Optimal hydration is the front line of defence for beating illnesses, and the easiest way to make sure your horse can compete to their highest level, or enjoy a long ride safely, Now you can get your horse to drink when and where you want to, by adding Horse Quencher to the water. Not an electrolyte. It''s a precise and proven blend of 100% healthy and natural grains and flavorings. Four great flavors to choose! 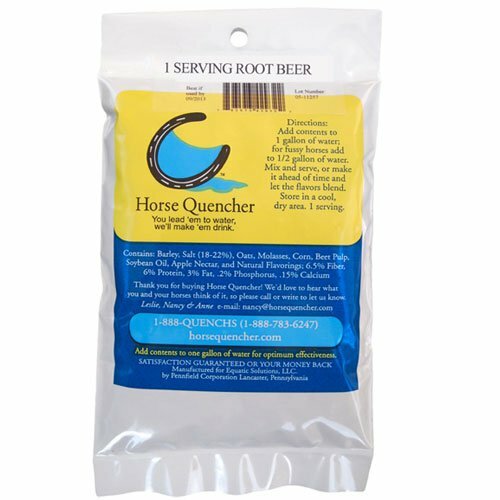 If you have any questions about this product by Horse Quenchers, contact us by completing and submitting the form below. If you are looking for a specif part number, please include it with your message.